I've been feeling more than the usual aches and pains recently in the garden. Blame it on the fact that my wife and I planted four trees, several large shrubs and dozens of perennials over the past few weeks. 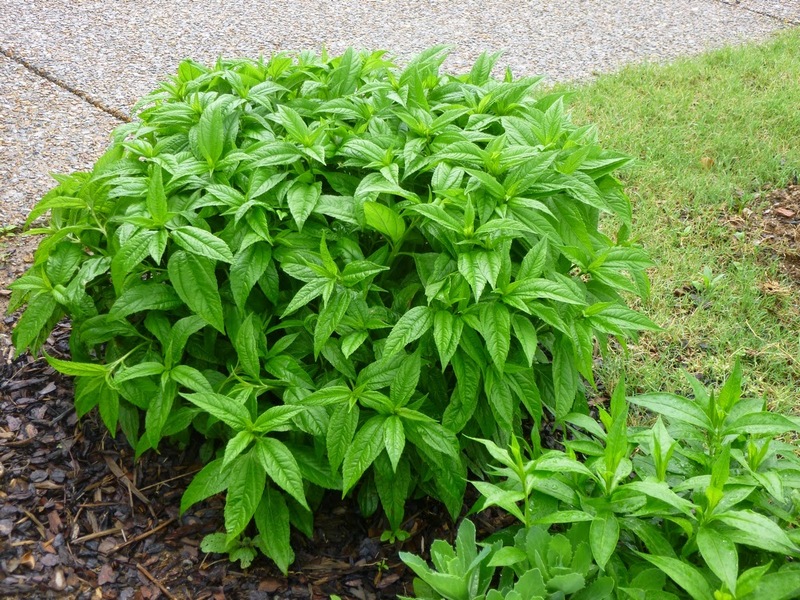 After all the heavy digging, it was ironic when I somehow strained a back muscle planting a tiny 4-inch Salvia greggii. So I've been thinking about how age is reflected in the garden. I don't know about you, but when I plant a perennial, a shrub or a tree (most anything but an annual), I have high hopes that the plant will get better and stronger with time. Sometimes, this wish comes true. Perennial Lemon Queen Sunflower looks about five-times bigger, bushier and stronger than it did last year. All the aronias have been going from strength to strength in the past couple of years -- more flowers, more berries, more healthy foliage, taller plants. I'm talking about plants like Gaura lindheimeri. I've seesawed back and forth in the past on whether I love this plant (gorgeous pink flowers over a long bloom season) or whether I'm ready to shovel-prune it (mass of ugly dead stems in the spring that seem to take forever to green up). Gaura lindheimeri in late April. Not looking promising. This year, I think Gaura is trying to save me the trouble of making up my mind. All of the gauras are a little later than usual in making their spring comeback. 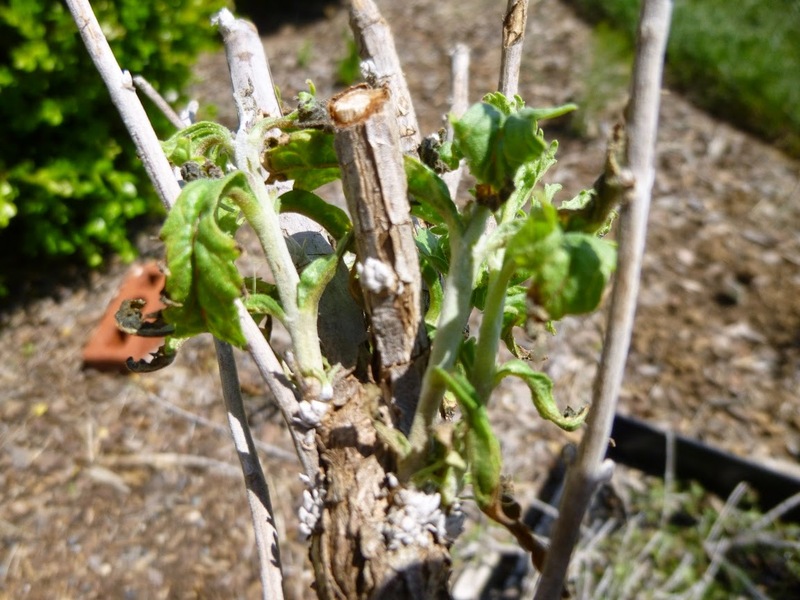 When I didn't see any growth at all, I started hacking down through the dead stems and found that many of them were rotted and could pretty much twist away in my hands. Not a good sign. It looks like what they say about Gaura needing good drainage really is true. And my heavy clay soil just isn't cutting it. That said, when I ripped away all the dead foliage, at least I discovered what looks like a bit of healthy foliage on the outskirts of the plant. Maybe I'll get at least one more good year out of the gaura? And I think there are a couple of seedling plants nearby. That's more than can be said for Russian Sage. Initially one of our favorite plants due to its silvery foliage and pretty blue flowers that attract bees, Russian Sage has gone downhill year by year. 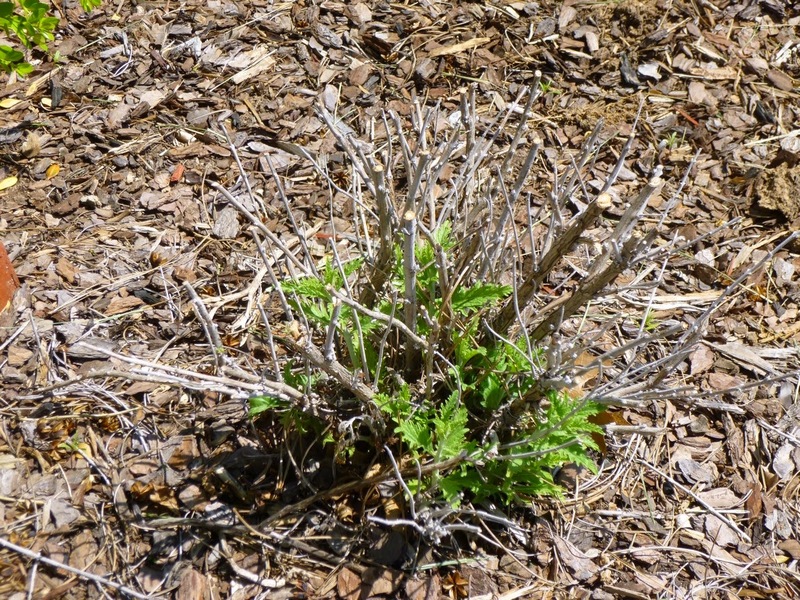 The experts say to cut Russian Sage back in the spring when it starts leafing out, but the plants aren't regrowing any leaves on the old wood, they seem to be sending up new shoots from the base. That creates a bit of an issue with new foliage emerging from a mound of dead wood. 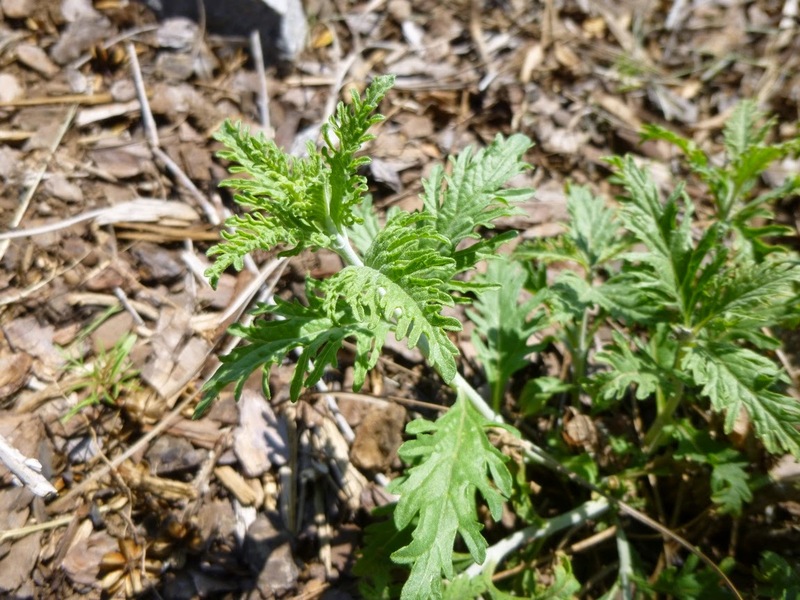 Worse than that, much of the new foliage starts wilting and browning within a few days of unfurling. This happened in earlier years too, but the whole process seems to be happening even faster this year. I suspect poor drainage may be the culprit here too. New Russian Sage foliage wilting just days after appearing. Not a pretty sight. I tried cutting away as much dead foliage as I could and leaving the healthiest looking new stems, but I suspect that these Russian Sages may all go to the great compost pile in the sky before the year is out. What's the lesson here? I guess for me it's a reminder not to rush to judgment. For better and worse, I'm often quick to praise a plant to the skies or heap scorn upon it. Sometimes a plant that soars in the spring will flame out before the year is done. Other times (frequently?) it can take a plant several years to settle into a new home, prove its mettle and show its true colors. Which plants in your garden get stronger year by year? And which ones have petered out over time? Aaron, the best performance I've ever witnessed by guara was in a situation with very sandy soil. In that situation, it was spectacular! This plant requires really well-drained soil to be happy. I think you've got a bit of clay, like I do-- I just replaced one this year, but I think for me it wasn't the soil so much as the 0 degree temps for a week! Sorry for the belated reply. I didn't see your comment until just now. So yep, I think that gaura needs well-drained soil to be happy. Ergo, it shall not be happy at Garden of Aaron! I also have issues with Gaura lindheimeri not performing in my clay soil. You and me both, Donna! 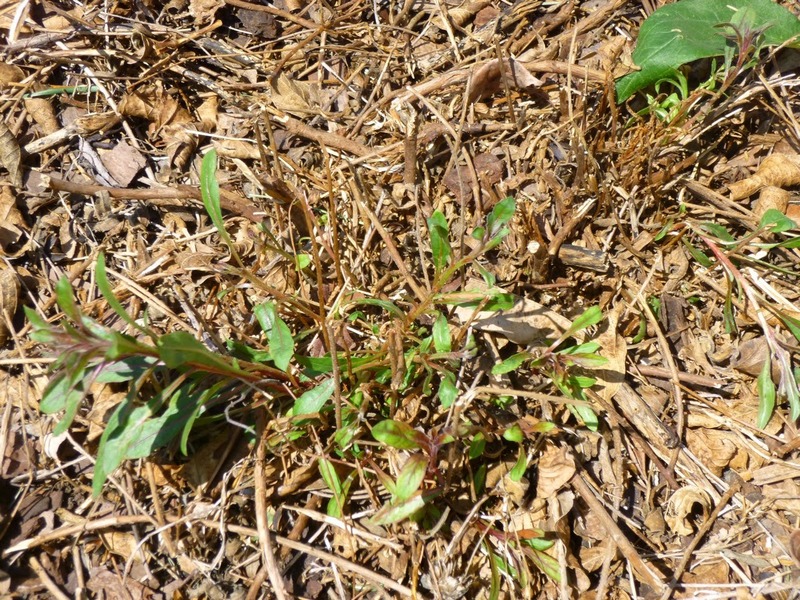 Thanks for the warning about Gaura in heavy soil. I got 2 this spring (my first foray into Gaura) and they are now in containers waiting until I move to my new house. After reading your post, I may just keep them there. As for Russian sage, yes, it needs very well drained soil too. I cut it back to about 6 inches in late winter, and it looks just like yours for a while. But then it takes off and does great every year. So maybe it's not time to give up on it yet. Yep if your new house has clay soil, you may want to either amend heavily, plant high or leave the gaura in a fast-draining container. I'm giving the Russian Sage another chance and so far they seem to be coming along better this year than in the last couple of years. Maybe they just need a *really* hard prune?? Some amending will make a huge difference. I find that the roots cannot get enough water or air if the clay is not amended. Since I amend mainly the planting holes and not the entire bed, this is a conundrum because supposedly when the roots of a shrub or tree hit the wall of hard clay they will start to circle in the amended soil and ultimately choke itself. However, I have found that after 5 years adding compost and organic matter on the top of the whole bed, even the unamended soil is softer. 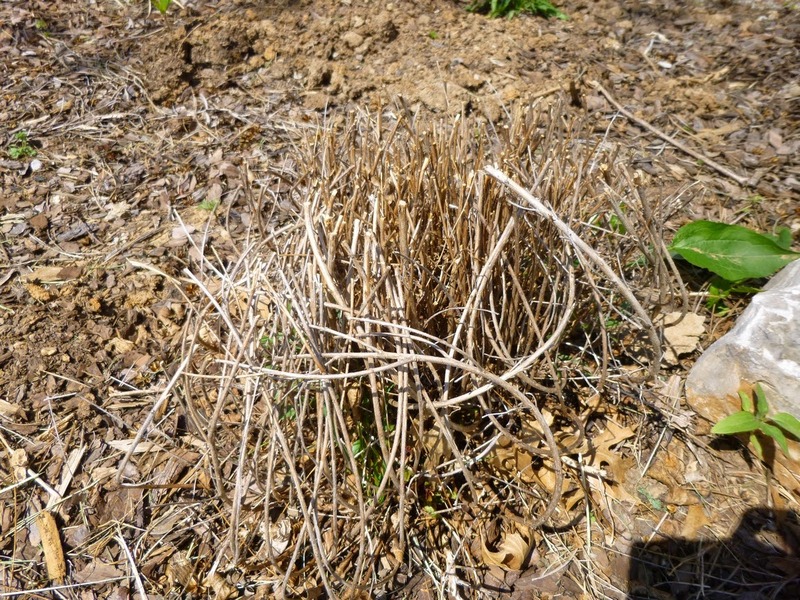 This spring I had some large hostas that had probably heaved from the freeze/thaw cycle and then rotted in the middle from freezing of young shoots. In digging them out to do some surgery I was happy to find that the surrounding but unamended soil broke into smaller pieces and had a better "hand" than when I put the bed in 5 years ago. When I originally put in the bed, I had to use the clay soil for parts of the bed because I had a large area to cover with not enough budget to haul in all new soil. I've added horse manure, bagged soil conditioner, mushroom compost, and leaf mulch--a motley mix--and for the plants that have lived it is working fine. This year I am going to try making a bed with layers of sand, wet newspaper, compost, purchased dirt and topped with mulched leaves in the fall. Check in next year for results. I think you're right that repeated and large scale amendment can help a lot of plants cope with ultra heavy clay soil. On the other hand...maybe I'm masochistic, but I'm trying to learn what plants can survive on their own in the unamended or lightly amended clay. It seems clear to me that certain plants must be able to survive since the earth is not bare in 'unamended' natural areas. Of course, the plants that do grow naturally and easily are not always the ones we want. It's been a steep learning curve -- and I'm still by no means an expert -- but I do think I've figured out a few plants that will not only tolerate but even thrive with our heavy clay and all the other challenges that come their way. Best wishes with your new bed!